Definition at line 398 of file TypoCorrection.h. Definition at line 400 of file TypoCorrection.h. 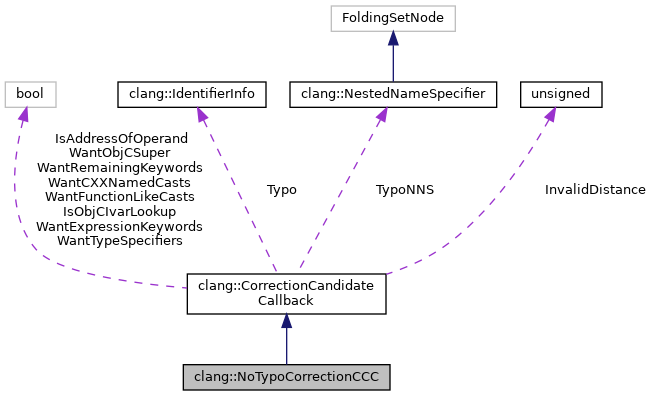 CorrectionCandidateCallbacks are initially stack-allocated. However in case where delayed typo-correction is done we need to move the callback to storage with a longer lifetime. Every class deriving from CorrectionCandidateCallback must implement this method. Definition at line 411 of file TypoCorrection.h. Simple predicate used by the default RankCandidate to determine whether to return an edit distance of 0 or InvalidDistance. This can be overridden by validators that only need to determine if a candidate is viable, without ranking potentially viable candidates. Only ValidateCandidate or RankCandidate need to be overridden by a callback wishing to check the viability of correction candidates. The default predicate always returns true if the candidate is not a type name or keyword, true for types if WantTypeSpecifiers is true, and true for keywords if WantTypeSpecifiers, WantExpressionKeywords, WantCXXNamedCasts, WantRemainingKeywords, or WantObjCSuper is true. Definition at line 408 of file TypoCorrection.h.